As a new parent you need to deal with the contents of a baby’s diaper, reflux and spit ups on a regular basis. This is because digestive problems are quite common in infants. There are different types of stomach problems that the infants face on a regular basis and if they become regular and serious, consulting a baby specialist becomes important. Eating is one of the most important jobs for a baby and there can be absolutely no surprise in the fact that projectile vomiting and reflux after feeding the baby might crop up. 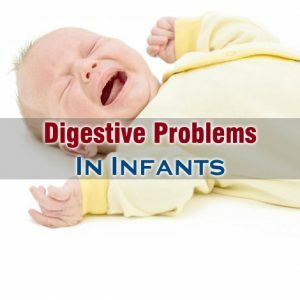 It is necessary for you to know how to deal with digestive problems in infants because you might never know when these problems get serious and require medical intervention. Most of the times, it take several weeks for the normal squeezing pattern of the baby’s stomach to get into perfect rhythm. Reflux is caused when milk sits in the baby’s stomach longer than normal. Infection of the intestinal tract is one of the most common causes of vomiting in infants. This infection is caused by almost any kind of virus. It is important to keep the baby hydrated if you notice signs of dehydration in your baby. Hard stool or constipation is one of the most common digestive problems in infants. This generally happens in infants who start eating cereals. Babies can also develop constipation around their first birthdays. Diarrhea is a condition when a baby passes loose, watery and frequent stools. It is one of the scariest conditions in babies because it can result in making the baby dangerously dehydrated. Air can easily get into the infant’s belly while he or she is digesting her food. It might cause pressure and this pressure can be very painful.